Here is the official Peppermint artwork for you to use when building wallpapers, themes, icon sets, etc. Please note that the images are copyrighted and though we encourage their use for your own creations, we ask that you do not use these to represent any projects or companies besides Peppermint. For instance, we welcome their use in a custom icon theme or a custom Peppermint themed wallpaper, but we do not welcome their use as a logo representing a new company or project that is not affiliated with Peppermint. Is it okay to use this artwork package on a website which will be related to Peppermint? My guess would be that if it's a personal blog kinda site that in no way attempts to suggest it's officially connected to Peppermint, and is NON-commerial then they'd probably be OK with it. That said, I'm NOT one of the copyright holders so that's a pure guess .. I've drawn their attention to this posting, so hopefully one of them will answer you soon (time permitting). It would probably make the question easier to answer if you gave them a clue to the sites purpose, if it's personal/commercial, and if it will be selling anything. I'm not selling anything. It's more meant like a tips/tricks site. I've done this since Ubuntu, creating a website with Google Sites to put stuff on that site which helped me and maybe others. So basically it will be a personal help/tips guide. I'd *think* that should be fine (as long as it doesn't attempt to claim or give the impression it's an officially sanctioned site), but best to wait till either Shane or Kendall respond. I want to know this, too. When we establish the standard using the Peppermint logo in a Web site, it will be good for the future. Mark is exactly 100% spot on. Please use the Peppermint artwork as long as you are not making attempts to misrepresent yourself as affiliated officially with Peppermint, misrepresent your entity as the owners and/or creators of the Peppermint software or the company - Peppermint OS, LLC. Also, you may not sell or distribute Peppermint OS, any version, without expressed written consent. Is there any updated artwork for peppermint 7. I would love to have a crack at making a few wallpapers for myself! I can give you the new logo as an SVG if you like .. then you can open it any size you like in GIMP (which will ask what size you want when you open the SVG) and export it as a PNG. Personal use ONLY please .. the above legal caveats mentioned by Shane & Kendall apply to the new logo too. Can we get an updated art pack for Peppermint 7? Also, what font is used in the logo? Thanks. The logo text doesn't use a "font", the text instead being a custom graphic. the logo and text can be downloaded below as SVG's (vector graphics), which you can import in GIMP any size you like without loss of quality .. then save as a PNG /JPG/etc. If there's anything missing, please just ask. The above images are also attached as a zip archive below. 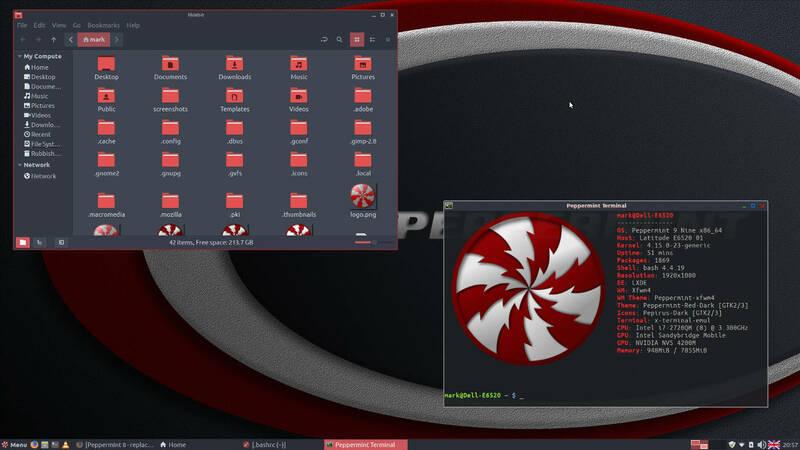 The theme is a gtk 3.22 theme, so probably won't work properly in earlier versions of Peppermint.